Today marks 31 weeks pregnant, we are now officially into the single figures countdown and I'm starting to feel all sorts of crazy emotions. I'm excited, of course, like kid on Christmas Day excited, because it means in 9 short weeks our baby will be here. But I'm also nervous and scared, about to start a whole new journey in my life for the first time, just hoping I get it right. Having a baby is a completely life-changing time in your life, especially if it's your first, and for a few weeks now as we've neared our due date, the sheer enormity of how my life will never be the same has started to sink in. I wouldn't swap where my future is headed, I am absolutely in love with this baby and I know that love will only increase a billion times more once they are here. They are a much wanted baby, a baby we planned and dreamed for, a baby that already has the biggest part in our lives and hearts. I wasn't sure how this post would go down, as I certainly don't want to give the impression that I'm not grateful for the chance we have here, being able to have a baby in itself is something not everyone can do and we know how lucky we are. We are hugely lucky, and so appreciative of how quickly we got pregnant, how smoothly our pregnancy has been so far and the fact that we have a healthy baby on the way. But that doesn't mean there are things I won't miss. Of course I'll miss things! I'm about to go from a 27 year old old care-free (OK, care-free-ish) woman whose biggest responsibility in life has always been herself, to being a mother. That is huge! 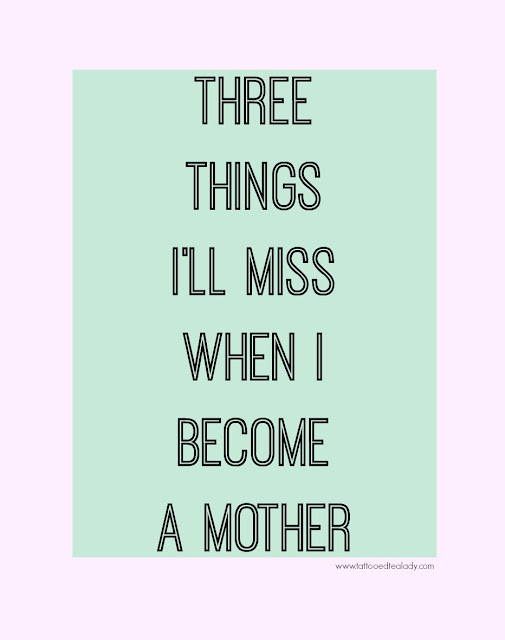 So here goes, 3 things I'll miss when I become a mother - and if you are a first time mum or dad to be who can relate, or have your own list of things you'll miss, I'd love to hear them! Long gone are the days where I could go shopping whenever I took the fancy, or long trips to London for days out, or even booking gigs on impulse and spending the night in a sweaty venue with a bunch of metal heads, and spending weekends at festivals are definitely a distant dream. I know they'll be times when we can catch a date night and have family watch baby for a couple of hours, and they'll be times when I 'watch the baby' whilst M goes out with friends and vice versa, but the ease and simplicity of just going out whenever we want has definitely disappeared. All that aside, I am so excited to enjoy different kind of days out with baby. Days in the park, with picnic blankets and tasty treats, visits to the seaside, when they're old enough, taking them to museums and showing them all my favourite places, just to name a few. There are so many things I loved when I was a child, places I looked to go and explore, to learn and experience new things, and I can't wait to do all of that with our baby! With Christmas around the corner, this one has already hit me. Yes, since a young age I've had the responsibility of looking after myself financially. That isn't an issue, but up until now, like most people, any 'spare' pennies have always been mine to spend as I please, on what I like. Body modification, new clothes, shoes and bags, beauty products, gigs and festivals, things I wanted, things I needed, things I definitely didn't need. Christmas and my own birthday used to be two times of the year I took this 'treating' myself to the extreme, buying from websites and brands I'd never usually buy any other time of year. I know, I know. I'm due to lose sleep and have restless nights and any sleeping pattern I once had is going out of the window once baby is here. That bit I don't mind. But personally? I have always been a night owl and find myself way more productive late at night (I'm talking 11pm onwards....), than any other time of day. I am going to miss staying up until the early hours of the morning, doing random midnight baking, binge-watching Netflix because I can't stop watching and the next episode always conveniently automatically starts for me, or getting so stuck into a new book that I stay up all night reading it from start to finish. Here's hoping me and baby manage to find a routine and pattern that works for both of us! haha not being able to go shopping is the hardest! good luck though! I'd definitely struggle not being able to book gigs whenever I wanted. Good luck for everything! Hi Sophia, I'll say just one thing as a Mum of 3 kids, 24, 22 & 15, even if you can't treat yourself the way you're used to doing as often, make sure to make those special moments just for you & regularly. Even if it's just a pampering bath/shower with no baby, or a coffee with a friend or an hour with a good book, make sure you have those moments. Being a mum is a full time job but I really think it's super important not to lose 'you' in amongst all the nappies and feeds & chores. Things will fall naturally into place when baby comes along for all of you & it's the best journey ever, enjoy!!!! You've got this. Life after having a baby is different, but you will love that baby so much. You won't mind it being different.